Currently unavailable. 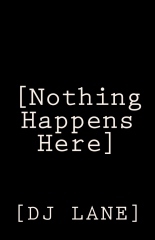 Nothing Happens here will be back soon under a new publisher with a shiny new edit and formatting. Stay tuned! Veronica Tracey lives in Upper Hutt, New Zealand. A small city that outwardly appears sleepy and quiet. Veronica knows better. With her 94-year-old Nana and the Cronies of Doom, her mad cousin’s love life, a retired greyhound, a new Private Investigation company and a crazy stalker, Veronica Tracey has quite enough on her plate. Just when life is in danger of becoming manageable, Benjamin Reynolds arrives from America wanting her help. He asks her to find three special garden gnomes. Amused, Veronica agrees. She then discovers they’re not the only ones after the gnomes. A good friend is involved and missing, and Nana is trouble.